We had this painting of Beethoven hanging over our piano when I was growing up. As I played, I would often stare up at him and contemplate his deafness and feel sorry for him. He was scary looking, and my brothers and I didn’t like him much. He has those following eyes and he watched me year after year with that unhappy look on his face as I sang and played the piano. Sometimes we’d find him on the wall in the basement where my brother and his friends would pea shoot him. But, somehow he’d make it back up on the living room wall. I would say, for sure, it was Mom who brought him down, and Dad who brought him back up again. Dad, who wore very powerful hearing aids, loved him. 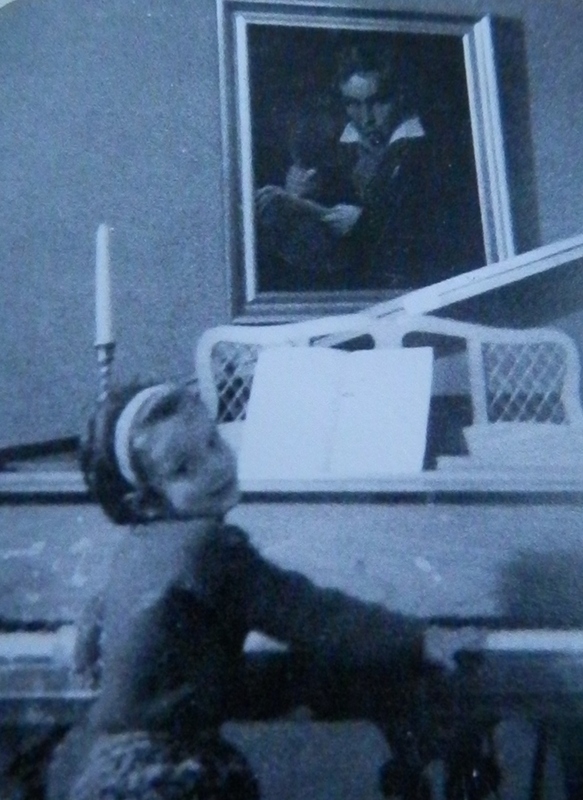 Dad bought him in a small artists shop in Italy during “the war.” Dad was musical, so was Mom, so he figured his kids would be too and shipped him home to give his someday family orchestra inspiration. Even though my father wore powerful hearing aides, nobody suspected this strong gene of deafness was carving through the family. The way OUR deaf gene works is we hear pretty nicely until we hit the age of 18. So we have learned to speak well. When Dad came back from the war, he needed hearing aides. He totally assumed his problem came from the bombs and the loud airplane engines. So I played and sang all those years not knowing that I was going to be a deaf as Beethoven. My oldest brother, John, got his first pair of hearing aides about the same time I did. We were in our early 20′s. William, on the other hand, who is also a musician, escaped the deaf gene. I have passed it on to my 2 children. My kids didn’t get the musical gene, and it’s a good thing, because it would be heartbreaking for me if they were performers and I wouldn’t be able to hear their performances. While I wore hearing aides, I performed for many years. The hearing aides amplify your natural hearing. From the age of 20 to 40 I performed. I got really good at singing and playing the piano because of sets after sets, nights after nights and years after years of it! (Sorry about the repetition, but you get the point) You can hear me singing and playing if you go to http://www.NanetteFlorian.com and look for my audition tape. Through these years, however, my hearing got worse and worse until it was totally gone. There was no more music. We all have things we mourn, I know; this was mine. We should have held a funeral service because a tremendous part of me died. So much time has passed without music. Music is SO hard to hear! ! ! ! But, it’s possible, and I haven’t given up. In fact, I’m writing and producing songs .Please don’t get the idea I write classical music. So far, it’s pop and country. “You Can Find That Room” a song that have lyrical approach never touched on before was a ball to produce. You can find it on http://www.NanetteFlorian.com. By next week, my country song “You’d Help Me By Loving Me” will be up on the website. Also, my favorite, Beethoven and Me along with a music video will be added. Can’t wait to show it all to you.